In greenhouses atop the Vinegar Factory market and adjoining bakery on Manhattan’s Upper East Side, Eli Zabar (inset) grows fresh tomatoes, a wide variety of greens, strawberries, and even figs. Eli Zabar’s bakery and market on East 91st Street in Manhattan seems like a classic New York market. On my half-dozen visits over as many years, I’ve reveled in the gorgeously displayed vegetables and fruits, the vast array of cheeses, and the wide assortment of breads and pastries baked next door. 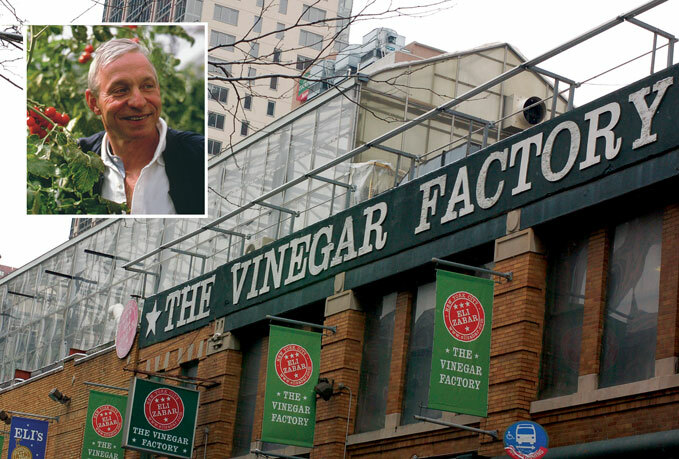 But Zabar’s market, the Vinegar Factory (named in reference to a prior use of the property), is anything but typical. The sprawling facility connecting multiple buildings demonstrates an unconventional dimension of agriculture: farming that is intertwined with the urban landscape. In 1995, Eli Zabar, renegade scion of the famous West Side Zabar family, whose markets have been serving New Yorkers for 75 years, began building greenhouses atop his two- and three-story brick buildings on the Upper East Side. These greenhouses, covering nearly a half-acre in area, are producing greens, tomatoes, berries, andeven figs that are sold—not cheaply!—in his market downstairs. Zabar is ahead of the curve, a pioneer in a trend that is likely to grow dramatically in the coming years. I’ve long been fascinated by the potential for integrating agriculture into the urban landscape—the sea of flat roofs and empty lots in our larger cities. This article looks at the motivation to turn to urban and suburban areas for food production, then examines how to do this, including some of the ways food wastes are being turned into nutrients to grow vegetables, eggs, meat, and fish in our towns and cities. The spike in energy prices in 2008 forced a lot of people to rethink the 1,500-mile journey that, according to author Bill McKibben, an average bite of food travels in the U.S. from where it is grown to where it is eaten. Shipping a head of lettuce from California’s Salinas Valley to New York takes 36 times as many calories as that lettuce contains. According to Lester Brown of the Earth Policy Institute, we consume two-thirds as much energy to transport food as we use to grow it. Beyond energy cost, there are additional vulnerabilities in our conventional food-production system. Prolonged drought in California, the start of a new La Niña climate pattern that may exacerbate drought, and inadequate long-term flows in the Colorado River all point to a future with possible water shortages in California’s primary vegetable-producing regions. These vulnerabilities are reviving interest in growing food locally. Salmonella outbreaks and other contamination problems become national problems affecting thousands of people. According to McKibben, four companies slaughter 81% of the nation’s beef, and a single Ohio farm produces three billion eggs per year. At a smaller scale, any problems that do come up are much more contained, with smaller impacts on the food supply. Finally, growing food closer to home can help to build awareness of—and appreciation for—food production. Many children growing up today have no relationship with farming; they have never seen a head of lettuce being grown, picked a tomato from the vine, or watched chickens scratching in the soil. Such awareness will help to build respect for the Earth and environment on which we all depend. 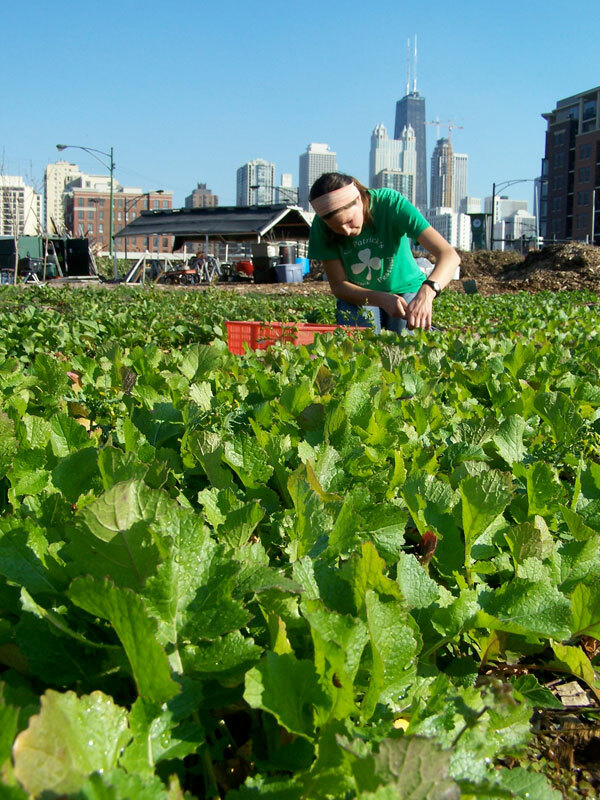 City Farm grows lettuce and other produce on top of two feet of rich compost on vacant property in Chicago. An impermeable layer of clay isolates the food from potentially contaminated soil beneath. Vacant Land in Cities: An Urban Resource, reported that 70 major American cities averaged 15% vacant land area. Geographically, cities in the South had the most vacant land (19.3% average) and the Northeast the least (9.6%). A movement has been growing slowly for several decades to use that land productively. This land can be used both for nonprofit and for-profit agricultural operations and community gardens. Provided here are a few examples out of the hundreds that can be found around North America. EBN. Over four decades the organization has farmed a varying area of unused land—currently about two acres (0.8 ha)—using a unique model of farming that protects food from being contaminated by the soils below. “Almost everything in urban areas is contaminated to some level,” Dunn said. He convinces owners of sizeable urban sites (typically one acre or larger) to “loan” the land to City Farm for several years. A site is graded and compacted, then an impermeable four-inch (100 mm) layer of local clay (typically sourced from construction sites as a waste product) is laid down on top of the existing soil. City Farm then puts down safe, uncontaminated compost on top of the clay, creating growing beds that are 24 inches (600 mm) deep. The farm is established in this compost, 1,000 tons of it per acre (2,200 tonnes/ha). Because of the thick bed of rich compost and the impermeable layer beneath, City Farm almost never has to irrigate. City Farm has ensured that the compost is safe—free of herbicides often used on lawns, for example—by controlling exactly what gets composted. City Farm collects food waste, including meat and dairy, from 18 restaurants in the city. Until recently, the organization composted this organic matter itself, using a massive 15-yard (12 m3) hopper and grinder. This composting operation was spread over an acre of land City Farm owned with rows of compost 15 feet (5 m) deep. In 2008, due to red tape from the City of Chicago, City Farm had to close down its own composting operation, and it now trucks the food waste it collects 80 miles (130 km) to a commercial composting facility in Indiana. The organization hopes soon to be able to produce its own compost again—and regain full control over the quality. To support its operation—and pay a living wage to its three full-time employees—City Farm sells heirloom tomatoes, salad greens, and other produce to 20 restaurants for top dollar ($3.50/pound for tomatoes and $20/pound for greens). At the same time, farm stands sell produce at more affordable prices to local residents. While City Farm is currently farming only two acres (0.8 ha), significant expansion is likely in the next year with several contract gardens for specific restaurants and a hospital. The hospital, which had to delay construction of a new building due to tight credit markets, is negotiating with City Farm to custom-farm the one-acre (0.4 ha) site and provide all of the produce to the hospital (which will be able to serve more nutritious food to its patients). Even with this likely expansion, though, Dunn is frustrated that their penetration remains so low in a city with 20,000 acres (8,000 ha) of vacant land. “We could farm 100 more acres every year if people took us seriously,” he said. Dan Bravin and Martin Barrett own City Garden Farms in Portland, Oregon. It is one of dozens of businesses throughout North America that are implementing the “SPIN Farming” model of farming enterprise (SPIN for Small Plot INtensive). In 2008, they farmed a dozen small plots, ranging in size from 500 ft2 (46 m2) to 3,000 ft2 (280 m2) around the city, with total planted area of about a quarter-acre (0.10 ha). The land is in backyards of Portland residents who offer it freely. EBN, but with some growth in the farm area and in CSA members from the current 50, the farm should soon provide a living. The SPIN Farming business model was developed by Wally Satzewich and Gail Vandersteen from Saskatoon, Saskatchewan. In the 1980s, they were farming 20 acres (8 ha) of irrigated farmland 40 miles (60 km) north of Saskatoon, but they lived in the city and kept a couple of small plots there for salad crops. They found that they could grow three crops a year on the intensively managed plots in the city and deliver fresher food to their markets. After six years, they sold their larger property and moved their farming totally into the city. In the years since, they’ve perfected an intensive, standardized, small-plot farming technique based on standard rows governed by the width of their rototiller. Most such operations are managed organically with extensive use of compost. The approach can be used in both urban and suburban areas, the primary limitation being the availability of sites with full access to sunlight. EBN that 2,200 people have purchased the SPIN Farming guides and, based on the members of an active SPIN farmers email support group, she estimates that there are about 300 SPIN farmers, mostly in the U.S. and Canada, though also in the U.K., Ireland, Australia, and the Netherlands. 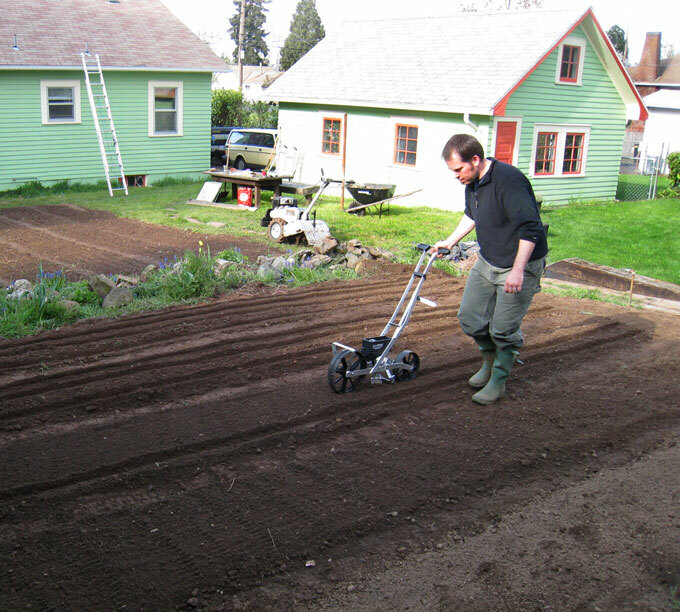 Dan Bravin, here using a seeder, farms a dozen backyard lots in Portland, Oregon, using an approach referred to as SPIN Farming. At City Garden Farms, Bravin has standardized beds that are 2' x 25' (0.6 x 7.6 m), and he estimates that each can earn about $100—or $300 per year if three crops are grown on it. His approach is to harvest an entire bed, then prep and reseed that bed. He describes the SPIN Farming approach as very similar to what has been done in Havana, Cuba, since the collapse of the Soviet Union resulted in the island nation losing access to cheap fossil fuels. Along with various models of commercial-scale farming in urban areas, community gardens have also been growing in popularity. There are thousands of grassroots community garden initiatives throughout North America. Some involve just a few individuals sharing growing space on land owned by a city. Others are more extensive, with multiple garden plots on land owned by a nonprofit community gardening organization; some are on private land. 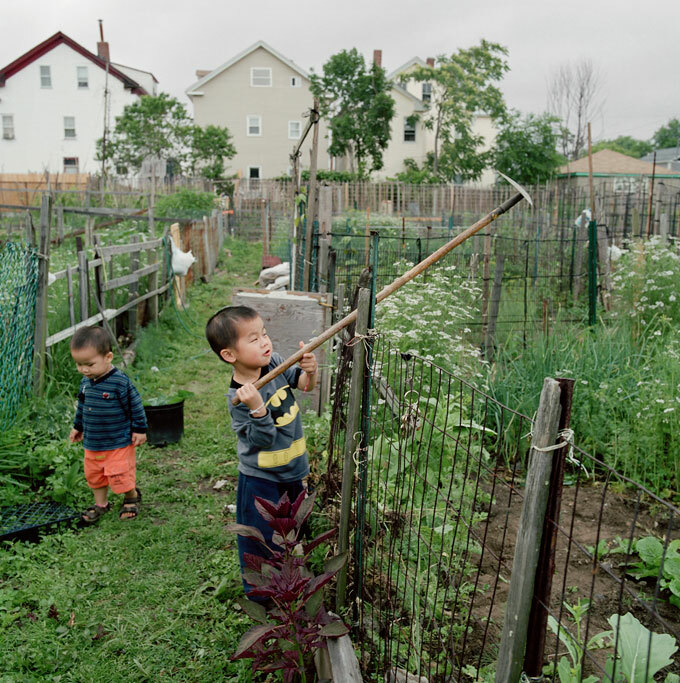 Nuestras Raices in Holyoke, Massachusetts, is a network of community gardens and farm enterprises in this economically depressed western Massachusetts city of 44,000, 40% of whom are Puerto Rican and with unemployment rates as high as 31% in parts of the city. Nuestras Raices (Spanish for “our roots”) was founded in 1992 as an outgrowth of the La Finquita community gardens in the city (www.nuestras-raices.org). La Finquita today includes 31 family garden plots, including one for the Broderick House, a homeless shelter, while the umbrella organization, Nuestras Raices, has blossomed into a diversified economic- and community-development organization that includes eight different community garden networks, two youth gardens, a women’s leadership group, an environmental justice initiative focused on toxic pollution in the city, a green jobs program, and the four-acre (1.6 ha) Tierra de Oportunidades Farm along the Connecticut River, which was purchased with support from the Trust for Public Land. Since 1980 the Southside Community Land Trust in Providence, Rhode Island, has worked with low-income inner-city residents to convert vacant land into 11 community gardens that are being farmed today by 220 families. In Detroit, another area suffering from extremely high unemployment rates, the nonprofit group Urban Farming has emerged as an important resource in the struggle to address poverty and hunger. The organization, launched in 2005, manages or oversees more than 50 community gardens in Detroit, and it has expanded nationwide with hundreds of gardens in New York, Newark, Minneapolis, St. Louis, Los Angeles, and other cities—more than 400 sites total (www.urbanfarming.org). Urban Farming partners locally with corporations as well as youth groups, senior centers, churches, schools, and other community-based organizations with the mission to “eradicate hunger while increasing diversity, motivating youth and seniors, and optimizing the production of unused land for food and alternative energy.” Harvested food is mostly distributed through local food banks, though neighbors are welcome to pick food for free, according to founder Taja Seville. Conventional practice in commercial development of all types is to install generic shrubs and shade trees in a sterile landscape of mounded mulch and turf. One can walk out of almost any office building, school, hotel, or restaurant coast-to-coast, and see the same landscape. Why not devote some of that landscaping cost and effort to trees and shrubs that bear fruit? This is one of the ideas of permaculture, a landscaping practice (the word derived from “permanent” and “agriculture”) pioneered by Bill Mollison of Australia. EBN was—remarkably—unable to find any examples of commercial buildings whose owners implemented an edible landscaping strategy. Why can’t employees at a Florida office complex go outside for a mid-afternoon stroll and pick a ripe orange from a well-managed landscape of dwarf citrus trees? Why can’t schoolchildren and teachers in Yakima, Washington, pick cherries, raspberries, and apples during recess? Wouldn’t this be the “low-hanging fruit” of a transition to more localized food production? At Eli Zabar's market in Manhattan, produce is grown both in greenhouses and in open planting beds above the Vinegar Factory, with the output sold in the ground-floor market. Vol. 7, No. 10), we calculated that the nation’s 4.8 million commercial buildings had about 1,400 square miles (360,000 ha) of roof, most of which is nearly flat—this is an area larger than the state of Rhode Island. 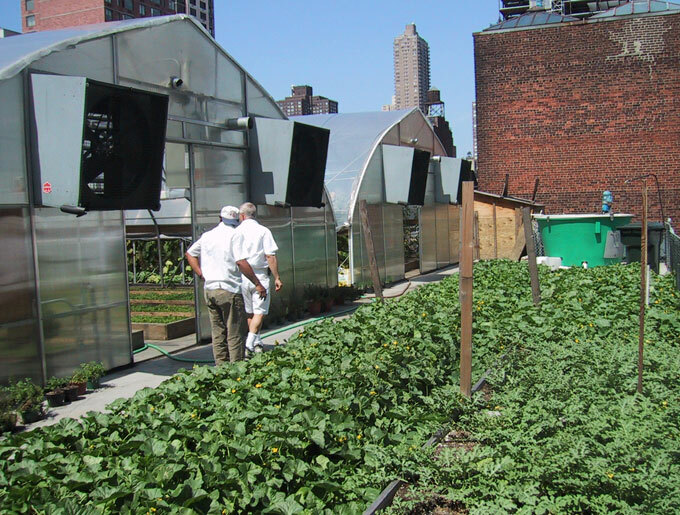 While lots of these roofs are shaded by neighboring buildings, are structurally inadequate to support rooftop activity, or are otherwise inappropriate for use, there are lots of buildings where rooftop gardens or greenhouses could very effectively be used for food production. Boucher-Colbert uses a variety of soil amendments for his organically managed gardens, including kelp meal, glacial rock dust, bone meal, blood, worm casings, and commercially available organic fertilizer. His soil depths vary from about 3" (80 mm) for the round planter beds to 18" (460 mm) in the raised beds. When necessary, he waters beds with a solution including a fish-emulsion and kelp organic fertilizer. His goal is year-round food production, offering chefs a variety of healthy, fresh, seasonally appropriate produce. Along with a variety of herbs, Boucher-Colbert has produced lettuce, arugula, tomatoes, peppers, eggplant, summer squash, cucumbers, and various specialty vegetables, such as golden-podded peas. Using green roofs for food production is not without challenges. Along with the structural loading issues (Boucher-Colbert cautions that one should not follow his example without a thorough inspection by a structural engineer), easy access to the roof is critical. In a multifamily residential or commercial building, occupants may not want urban farmers traipsing with wheelbarrows of fertilizer and muddy tools through a public lobby. EBN. He currently manages four greenhouses, the largest 40' x 100' (12 x 30 m), with a full-time greenhouse staff of two. Since he built the first of his rooftop greenhouses, Zabar has always grown in soil. While he has visited lots of successful hydroponic greenhouse operations, he believes that produce grown in soil tastes better. “I’m not interested in hydroponics,” he said. With soil-based growing, he’s also able to make use of compost that he produces on the roof using discards from his market. He has an eight-foot (2.4 m) diameter drum with an auger that is turned regularly to mix the compost. His recipe for compost includes sawdust and bread from his bakery (which supplies about 1,000 restaurants in the city). Zabar would like to compost more of his organic waste but can’t. “We could do a ton more, but there’s a space limitation,” he said. Ducts from his bakery ovens heat the rooftop greenhouses, providing all of the needed heat for his lettuces and herbs. For tomatoes, he has to supplement that heat to maintain an optimal temperature of 75°F (24°C). 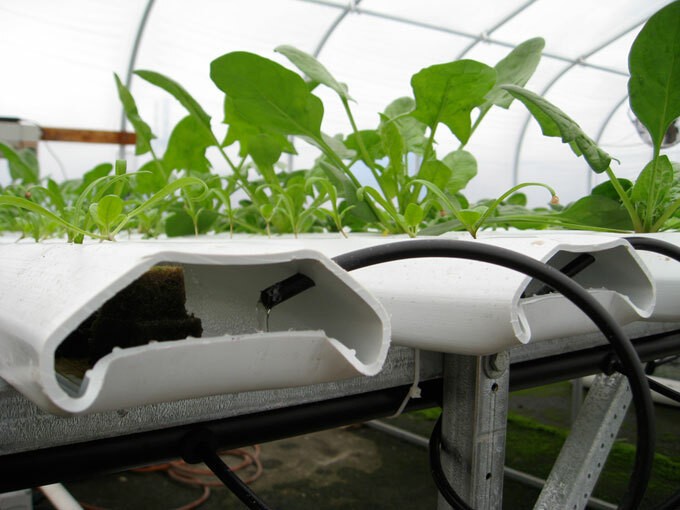 With NFT hydroponics, the nutrient solution trickles down plastic channels, with plants growing through holes in the channel. These channels from American Hydroponics are made from high-density polyethylene. EBN, and another 15 projects that stand a good chance of moving forward before the end of 2010. 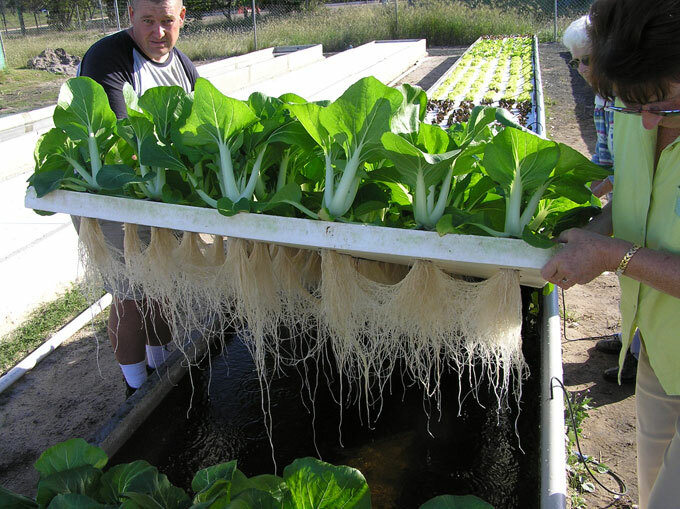 This private research aquaponics farm in subtropical Australia is producing Pak Choi using raft hydroponics. The sole nutrient is waste from Barramundi table fish. The yield is 1.5 tons of vegetables for every one ton of saleable fish. The Pak Choi shown here is three weeks old. raft hydroponics, plants are grown on a floating raft with roots extending into nutrient media. 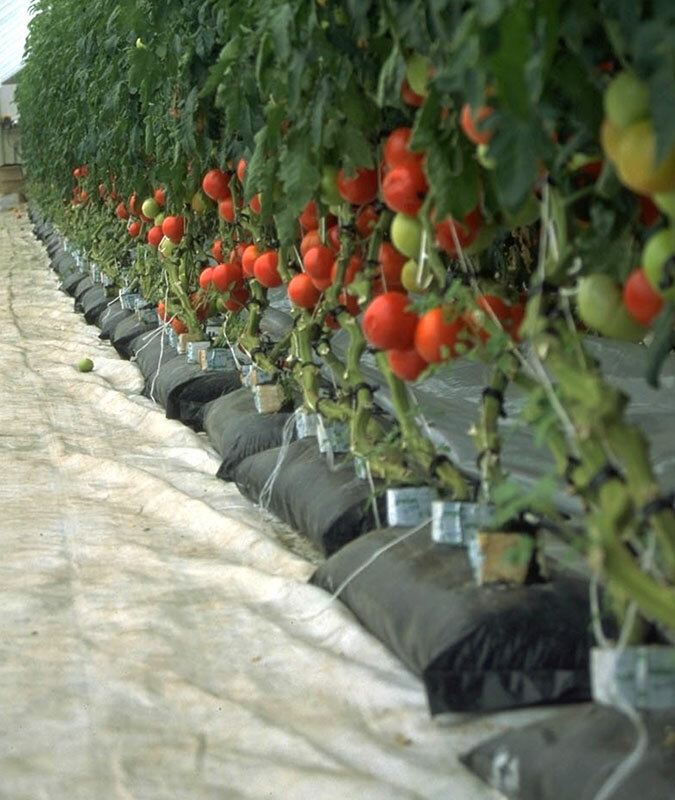 This approach adds considerable weight, depending on the depth of the hydroponic tanks, so it is most commonly used in ground-mounted greenhouses, not rooftop applications. Nutrient film technique (NFT) hydroponics is used for leafy plants, such as lettuce, spinach, and basil; the nutrient solution is circulated through hollow plastic channels that support the plants, and the plant roots hug the surface of the channel to absorb the water and nutrients. This is a recirculation technique; nutrients are added to the solution in the reservoir. Of relevance to rooftop applications is the lighter weight of NFT compared with other hydroponic approaches or soil. The primary weight is the reservoir, which can be located on a portion of the roof that has adequate structural reinforcement—so the entire roof structure may not need to be strengthened. Dutch bucket hydroponics involves buckets or bags filled with an inert media—such as perlite, vermiculite, or mineral wool—through which the nutrient solution is circulated; this system is used primarily for tomatoes, peppers, root vegetables, and other plants with more substantial stems. In this type of facility, there is greater weight spread throughout the greenhouse, both from the buckets and the plants themselves, which can be quite heavy when fully grown. With Dutch Bucket hydroponics, nutrient solution is trickled through buckets or sacks filled with an inert growing medium. EBN that the hydroponic farming movement has so far been less focused on organic methods. That is beginning to change, though, particularly in Europe. Aquaponics is a relatively new approach to food production, combining both recirculation hydroponics and aquaculture (fish production). Some of the earliest research into aquaponics began in the 1970s at the University of the Virgin Islands, where James Rakocy, Ph.D., developed a commercially viable aquaponic system using raft hydroponics. The beauty of aquaponics is that it offers a balanced nutrient cycle that does not require the addition of fertilizers. It also solves one of the significant problems associated with aquaculture: what to do with fish waste. Aquaponics Journal), ammonia-rich fish wastes are broken down by bacteria into nitrate—the form of nitrogen that plants use. This nutrient solution is used in a recirculating hydroponic system—most commonly raft hydroponics but occasionally NFT or Dutch bucket hydroponics. Due to the weight of fish tanks, aquaculture is rarely a rooftop enterprise, though it would be possible to locate the fish tanks at ground level with NFT hydroponics on the roof. EBN, especially if space is tight. “Even an eighth of an acre [500 m2] could be viable for a commercial operation,” she said, making aquaponics a good option in urban areas as long as there is adequate sunlight for the hydroponics. Nelson and Pade sells packaged systems for aquaponic farming and provides estimates of annual yield. A small commercial system, occupying a total greenhouse footprint of about 16' x 20' (5 x 6 m) and selling for about $4,000, including all tanks and raft hydroponic trays, is estimated to produce over 180 pounds (82 kg) of fish and 1,500 heads of lettuce (without supplemental lighting) per year. Fish waste from a dozen large tilapia tanks (in the background) fertilizes organic greens at this AquaRanch aquaponic facility in Illinois. 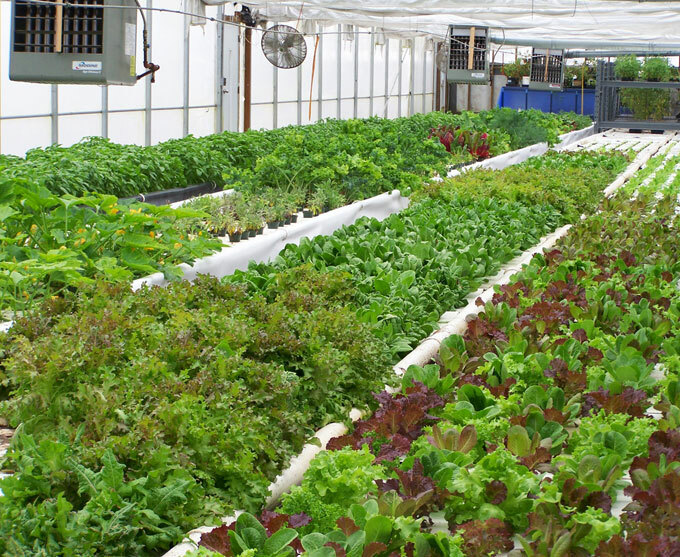 To date, there aren’t many commercial-scale aquaponic systems operating in North America. One of the most established is AquaRanch Industries in Flanagan, Illinois, where Myles Harston has been working with aquaculture since 1985 and aquaponics since 1992. In twelve 1,200-gallon (4,500 l) fish tanks and eight hydroponic trays measuring 4' x 150' (1.2 x 46 m) in a 12,500 ft2 (1,200 m2) greenhouse, AquaRanch grows tilapia (a freshwater fish favored by aquaculturalists because it does well in low-oxygen, cloudy water) and a wide variety of vegetables including lettuce, kale, chard, herbs, tomatoes, and hot peppers. All of the company’s vegetable produce is certified organic, and Harston is hoping to become certified for organic fish production as soon as that standard, currently under development, is finalized by the U.S. Department of Agriculture. Demand is strong for AquaRanch’s tilapia filets and organic produce, which the company sells through its website. “We are having trouble meeting the demand,” Harston told EBN. inside buildings? It’s an idea that has been gaining some attention. BrightFarm Systems is advancing an idea it refers to as the Vertically Integrated Greenhouse. Linsley explained that this technique was originally developed to be incorporated between the layers of glass in a double-skin façade of a commercial building, a system that is more common in Europe than North America. Plants would be grown in little pockets on a vertical frame and managed hydroponically; the inner glazing would separate the greenhouse area from the occupied space. The City Chicken Guide. Raising hens complements community gardening programs because of the fertilizer chickens produce. Laws relating to keeping chickens vary widely. In some cities, such as Boston and Toronto, chickens are banned outright. Other cities, such as Seattle and Baltimore, limit numbers and prohibit roosters. Often there are setback requirements from neighbors, and Minneapolis requires that applicants get approval from 80% of neighbors within 100 feet (30 m). Chicken laws for several hundred cities can be found at www.thecitychicken.com. As with chickens, there is growing interest in raising bees in some cities. While Boston prohibits chickens, it is one of a number of cities that encourage beekeeping to aid in pollination (others include Chicago, Seattle, Dallas, and San Francisco). Though New York City currently bans beekeeping—classifying bees as “wild and ferocious animals” (along with lions and alligators)—there is an active effort in the city to overturn that designation. Awareness of the value of bees has increased as a result of Colony Collapse Disorder, which has devastated commercial beehives throughout the country. Raising livestock and poultry for meat is less common in cities, though some large cities permit livestock. Growing Power, an urban farm in Milwaukee, raises ducks and goats for slaughter, the latter serving many of the city’s ethnic communities. Growing Power also uses goat milk to make artisan cheeses. 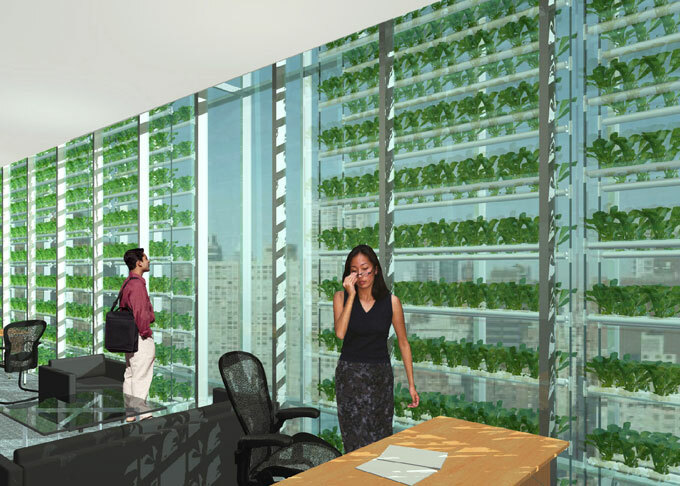 BrightFarm Systems in New York City is promoting the idea of producing food inside buildings, as shown in this rendering. Scientific American have been rife with articles on this futuristic model of farming. Some articles have even suggested that our meats will be produced in industrial laboratories through cloning of cell tissue—animals won’t even be required. Dickson Despommier, Ph.D., a professor of Environmental Health Science at Columbia University, has been a leading proponent of this concept through his Vertical Farm Project (www.verticalfarm.com). As an exercise in evaluating possibilities, this is a fascinating discussion, but as a practical reality, it is difficult to imagine that the infrastructure costs of multi-story, vertical farm structures could be even remotely economical. The model also promotes the kind of factory process that many food experts say we should move away from. We’ll leave this discussion, for the time being, to science fiction. Integrating food production into the built environment—from community gardens on empty lots to rooftop hydroponic greenhouses and aquaponics—offers an opportunity to reduce the energy intensity of our food system. 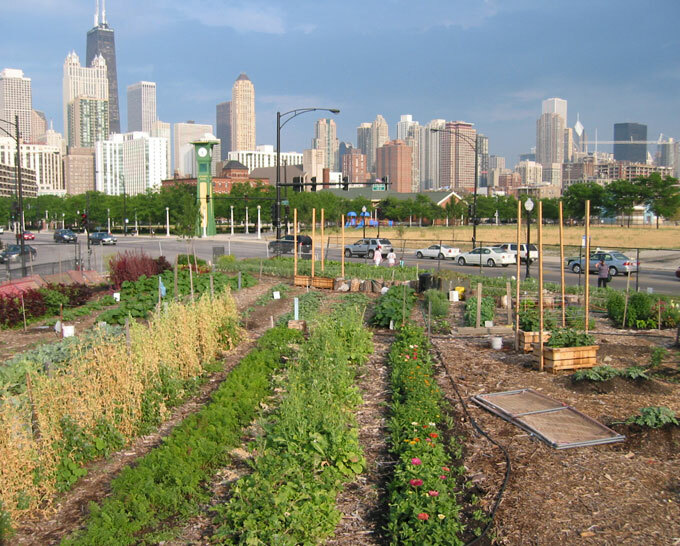 This urban and suburban agriculture seems like a new idea, but the basic idea isn’t new at all. A few short generations ago, prior to the industrialization and regionalization of agriculture, local food production was a way of life in America and elsewhere. And in the 1940s, during World War II, Americans were convinced to plant “Victory Gardens,” and they did so by the millions. In 1943, 20 million Victory Gardens produced 40% of America's fresh vegetables, according to the U.S. Department of Agriculture. Vol. 17, No. 4) addressed why and how to create buildings that will maintain livable conditions in the event of extended loss of power or heating fuel or shortages of water, producing more of our food locally offers a level of security we don’t have today. Hopefully, this won’t become necessary, but the chance that it might should be a strong incentive to move in this direction. Information on the Resource Center, one of the organizations featured in the article, can be found at http://www.resourcecenterchicago.org. The local food cycle is broken if we send food waste to the landfill. Illinois is (finally) contemplating legislation that will make composting easier by redefining food scraps. If the law is changed, food scraps will no longer be defined as garbage and will be able to be dealt with inside the rules that currently apply to landscape waste composting. A link to the proposed bill (SB99)is http://www.ilga.gov/legislation/billstatus.asp?DocNum=99&GAID=10&GA=96&D.... This is needed legislation. If you are interested in supporting it, please contact one or more of the sponsor. I thoroughly enjoyed the article on Growing Food Locally:Integrating Agriculture Into the Built Environment. I did want to mention one potential source of land for locally produced food integrated into the built environment, church property. I do have a successful example of bringing edibles into the town landscape. Until recently I served as environmental program manager at Alys Beach, a traditional neighborhood development under construction on the panhandle coast of FL. I was able to work with our landscape architect to introduce the concept that our landscapes should not only be beautiful but should feed us too. While vegetable gardening needs more intensive inputs, fruit and nut trees/shrubs are really easy. Last spring we planted 220 rabbiteye blueberry bushes of four different varieties (best for cross pollination and extended fruit season) in a park area so that every June-July residents and visitors will enjoy a fresh harvest. We hope to later add more edibles that are well-adapted to North Florida--cold-hardy citrus, figs, loquat--and others. Every part of the world has wonderful, easy-to-grow fruit and nut trees that should be included in our landscapes as one more statement for local food production, while providing the expected benefits of shade, beauty, etc. You noted in the "Permaculture landscaping" section that you had no examples. there is a co-housing example in Northern California that almost all of their landscape is edible. kids go play and if they are hungry just pick fruit and eat it. kind of cool.